It's time for another Book Exchange. This month, I'm giving away Susan Jane Gilman's Hypocrite in a Pouffy White Dress . If you'd like it, leave me a comment on this post by Monday October 15. I'll pick a random winner and mail you the book. Please make sure I can find your email address, either in the comment or on your own blog. The only requirement is that you pass the book along when you're done - either through a Pay It Forward post of your own, or by just giving it to someone who wants to read it. The book is fun - it's a fluffy quick read - a non-fiction account of growing up in Manhattan. Edited to add: Aliki2006 won! I'm looking for new reads, so I'll throw my name into the ring! I did like it - it was a fluffy quick read - a non-fiction account of growing up in Manhattan. Even though I should get through the books I already have, I really can't help myself. Your book sounds good, so please enter me in your drawing. 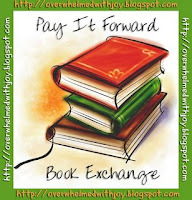 I have linked you in my Pay It Forward Book Exchange October post. Thanks for participating by hosting your own giveaway. I do appreciate it! I loved that book! You are right - a funny, quick read. What a cool idea. Hmm, maybe I should have tagged you for that book meme I posted today. Well, if you want to do a book meme, consider yourself tagged! Absolutely! Throw me in the pot. My name, I mean. I'm just back from a new book club and with that and my school books, my bedside table is stacked too high. But good idea! I've seen that book around. Is it any good? Count me in too. I'm doing my drawing after 8 pm EST tonight if you can get by and enter before then! This sounds great, please count me in, thanks! Please enter me in your drawing. It's sounds like a good read.